Finding a specific programming block with in the AI2 Blocks editor can be hard for new AI programmers. You found a great code example online and want to recreate it by entering the blocks in to your program – but you cannot find that red block in the middle of the code sample? Where is it? !!! You start poking around the drop down lists, scanning up and down the pop up menus, missing it the first time(!) and then going through all the blocks again until you finally locate that darned block! Frustrating! 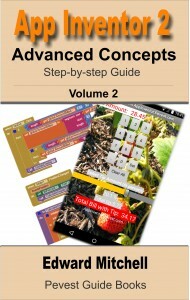 For a complete description of Volume 1 (Introduction), Volume 2 (Advanced Concepts) and Volume 3 (Databases and Files), please see my App Inventor 2 e-books page where you can view the table of contents, download a sample chapter, and find links where you can obtain these ebooks online at Amazon, Google Play, Kobo Books and so on. 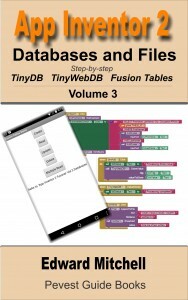 Volume 3 covers TinyDB, TinyWebDB, Fusion Tables, Files and exchanging data with CSV format files. Volume 3 is a big e-book – 322 pages long, says Amazon’s page counter. Links to all 3 books are available here. 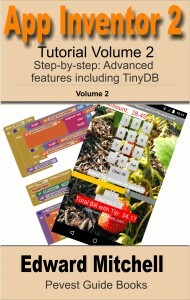 Volume 2 of the App Inventor 2 Tutorial is now available at Amazon as an e-book via this link: App Inventor 2 Tutorial Volume 2: Step-by-step: Advanced features including TinyDB . The e-book will also be available from Google Play shortly. 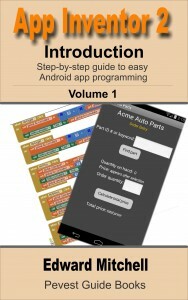 MIT App Inventor 2 is a fast and simple way to create custom Android apps for smart phones or tablets. Volume 2 in the series introduces debugging methods, explains additional controls not covered in Volume 1, introduces “agile” methods for developing a real world app, and provides sample code for using the TinyDB database. The App Inventor 2 Tutorial series is targeted at adult learners (high school and up). App Inventor 2 provides a simplified “drag and drop” interface to layout your app’s screen design. Then implement the app’s behavior with “drag and drop” programming blocks to quickly assemble a program in a graphical interface. Volume 1 of this series covered the basics of the App Inventor user interface Designer and the Blocks programming editor, plus basic “blocks” programming concepts and tools for arithmetic, text processing, event handling, lists and other features. Volume 2 builds upon Volume 1 to provide tips on debugging programs when the apps work incorrectly, how to use hidden editing features, and how to install your own apps on to your phone or tablet for general use. Code samples are provided for using the Notifier component for general use or for debugging, for user interface control tricks such as buttons that change color continuously or implementing the missing “radio buttons” component, using ListPicker and Spinner for list selections, and using the WebViewer to display web pages in your app. The book includes a large section on designing and building a sample real world application and finishes with a chapter on using the TinyDB database. 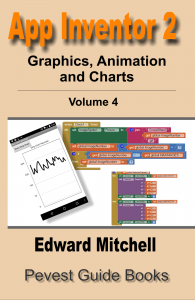 For readers of the blog, Chapters 4–8 are based on the tutorial already presented here. Chapter 2 and Chapter 9 on TinyDB are all new material. 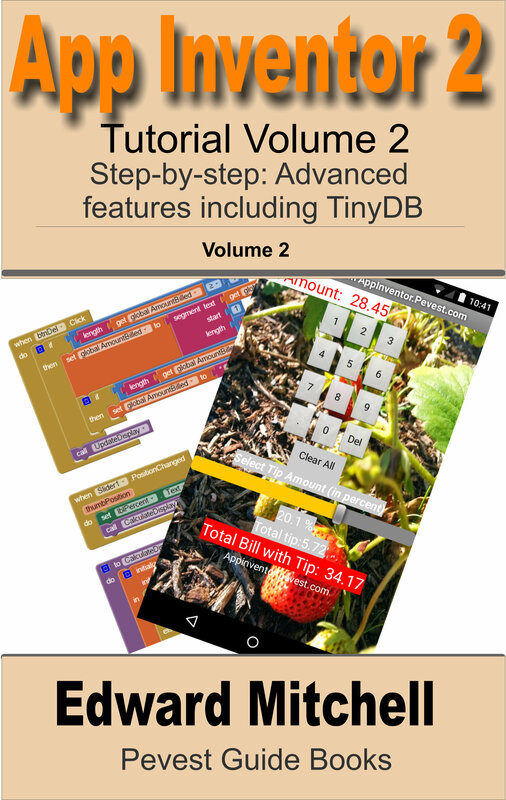 (Volume 3 is now available – App Inventor 2 Databases and Files adds substantially more information on TinyDB, plus TinyWebDB and Fusion Tables and includes the full introduction to TinyDB).